Have you gotten your hands on the Celebrate Friends collection yet? I'm starting to see projects popping up on social media already!! 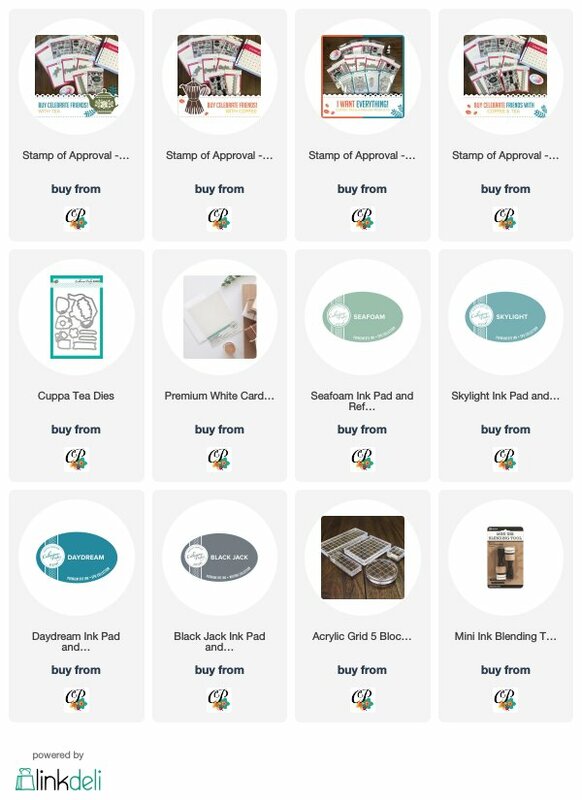 I love seeing all of the fun ways customers use these products. Though I'm almost exclusively a coffee drinker, I'm pretty smitten with the Cuppa Tea set. I love all the little accents and ways that you can dress up the teapot and cup. I went with a soft Spa color palette (the blues and greens in this line are to die for!) 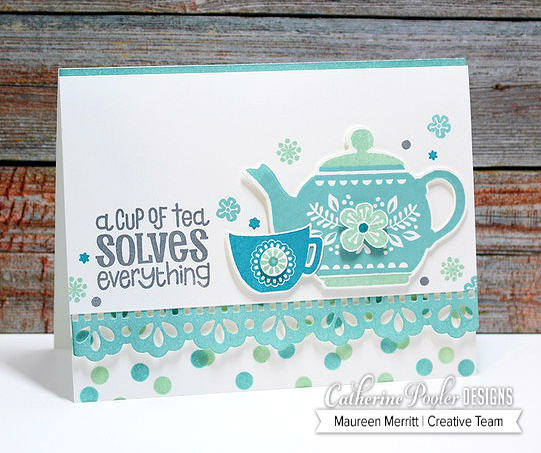 and paired Cuppa Tea with the Bordering Sweet die and Scattered Circles stencil, both included in the collection. I love how these products work so well together! 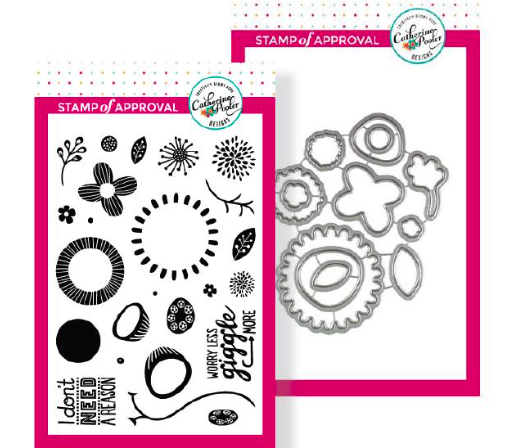 Stamp of Approval collections are only available while supplies last, so hurry up and pick your collection. Are you team coffee or tea? 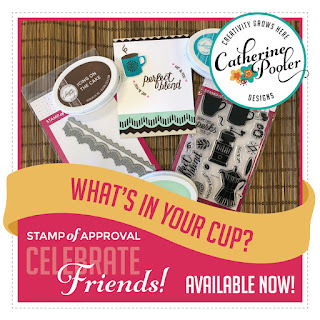 Celebrate with Friends SOA collection - Available Now! YAY! 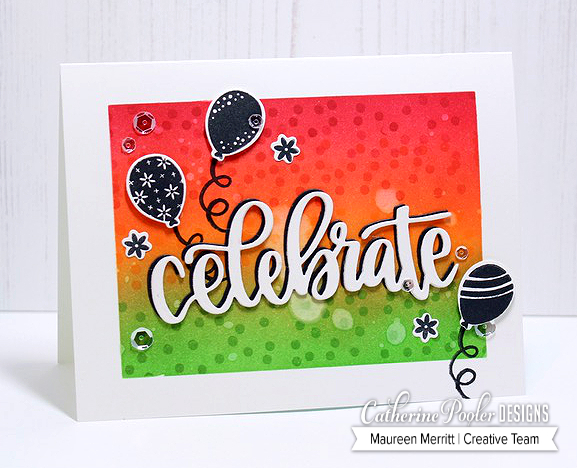 The Celebrate with Friends SOA collection is now available for purchase! Hurry, it's only available while supplies last. I'm finding this collection really lends itself to the CAS style! 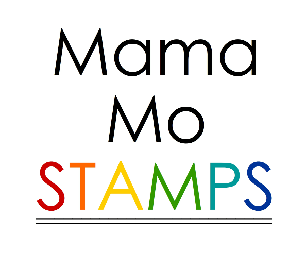 Here I used the shadow stamping technique with the Woohoo stamp set. To create my card, I started with a 3 3/4 x 5" piece of Sand Dunes card stock. Then I did the shadow stamping. To do this, stamp all of the images in white pigment ink and then let it dry for a bit. Then stamp the images again, slightly offsetting them in colored ink. I used Rockin' Red, Tutti Fruitti, Tiki Torch, Grass Skirt and Fiesta Blue. 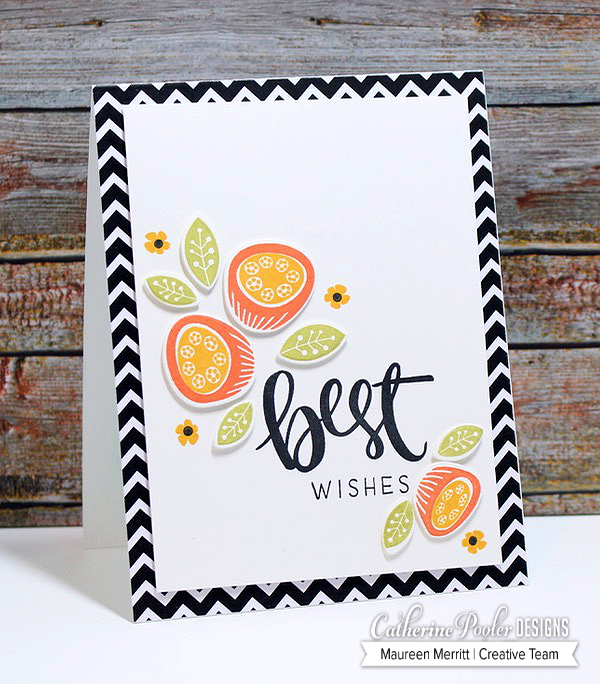 I heat embossed the sentiment and added the stamped panel to a white card base. I finished the card with a bow tied with bakers twine. Okay, time for you to grab your SOA box before it's too late! Happy shopping! 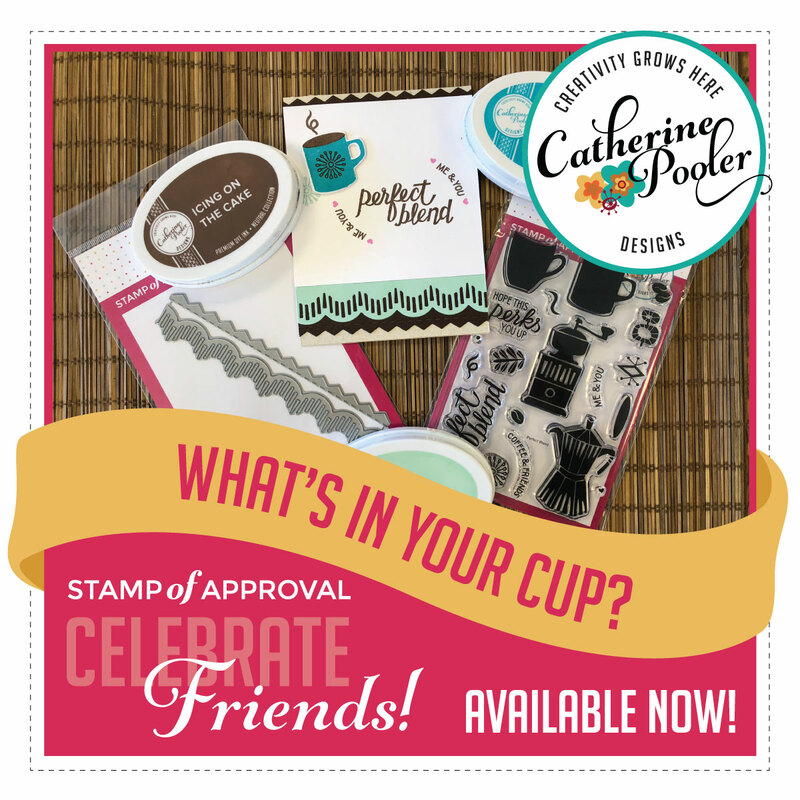 Welcome to Day One of the Celebrate with Friends Stamp of Approval blog hops. I'm so excited for this box to release! You all are seriously going to LOVE it! 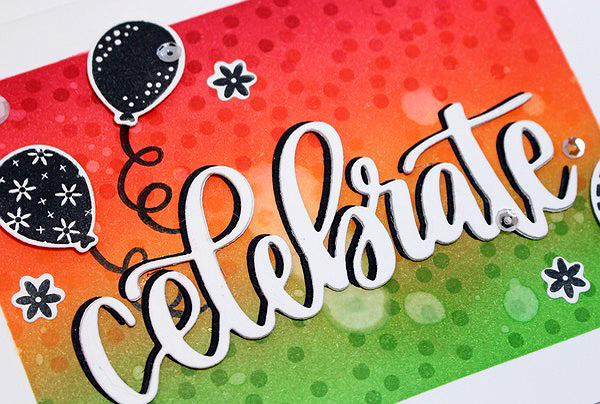 The Celebrate with Friends Collection will be released to the Wait List on April 24th at 9AM and the general public at 6:00PM!! This is a limited collection that will only be available while supplies last, so make sure that you are on the Wait List to be notified when it is available. StampNation members get early access on April 23rd (a little perk of being a member!). 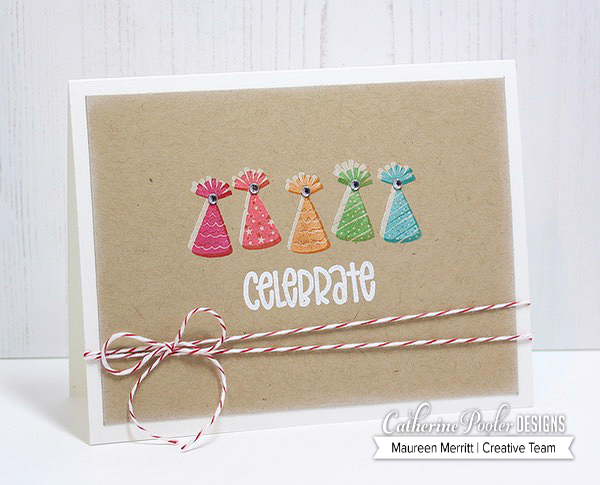 My first project features the Woohoo stamp set and add-on dies and the Celebrate die. 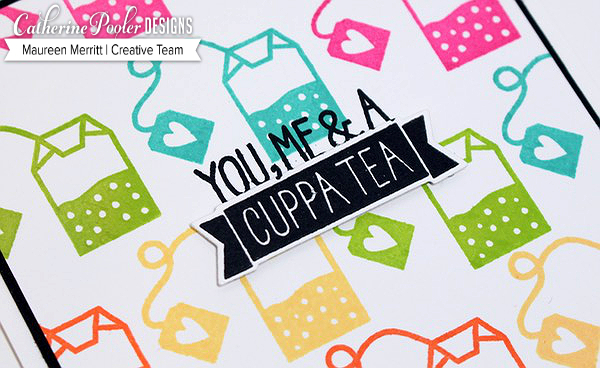 My next card features Cuppa Tea and the coordinating add-on dies. This card came together quite quickly and easily. I began by stamping the background with the tea bag from Cuppa Tea in Party Dress, Orange Twist, Tiara, Lime Rickey and Aquatini inks on a piece of white card stock that was trimmed to 3 3/4 x 5". Using my MISTI stamping tool, I stamped the sentiment 3 times in Midnight ink. I really wanted the sentiment to pop, so I stamped it again on a scrap piece of white card stock and die cut it using the Cuppa Tea add-on die. I adhered that to the stamped panel with foam tape. I added the panel to a 3 7/8 x 5 1/8" piece of Midnight card stock and added them to a white card base. Don't forget to leave comments along the way. THREE randomly chosen winners will receive a $97 gift certificate. 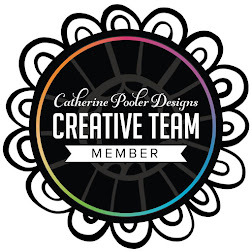 Winners will be posted on Catherine's Blog at 6 PM on Monday. 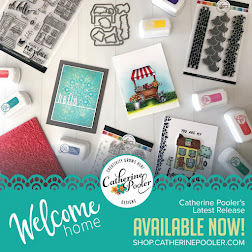 Hello and welcome to the Right at Home + Catherine Pooler Ink Blog Hop! 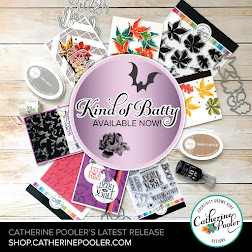 Right at Home Stamps is now carrying the Catherine Pooler line of inks, WOOT! 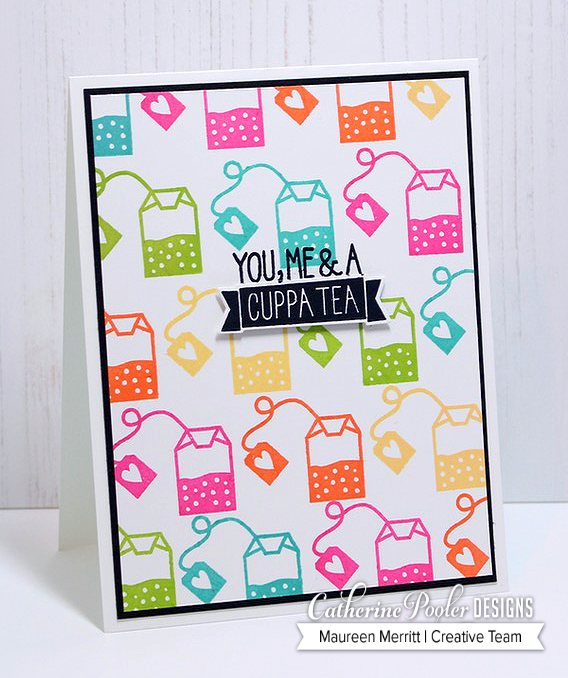 Today we are hopping along sharing projects that use CP inks and Right at Home Stamps! I've had my eye on this stamp set for sometime. 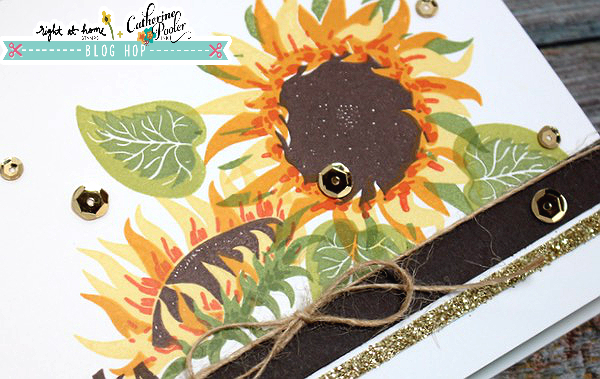 Sunflower...absolutely gorgeous, so life-like and stunning stamped with the CP ink line. For the sunflower I used colors from the Spa Collection (from lightest to darkest) Shea Butter, Sauna, Mandarin Spice and Icing on the Cake. The leaves were stamped in Green Tea and Eucalyptus. 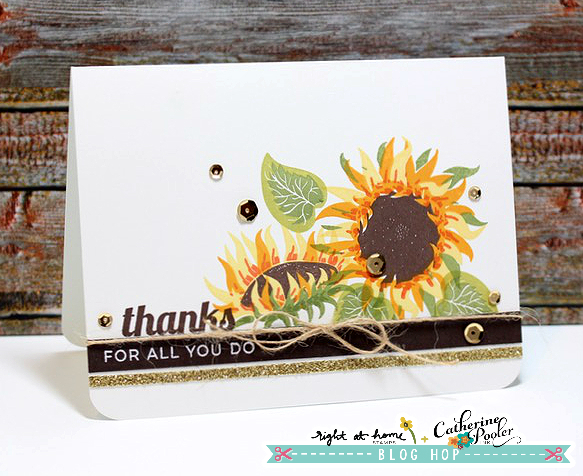 The sentiment comes from the Fall Sentiments stamp set, which is perfect year around! Time to go hopping along now! Leave comments along the way. 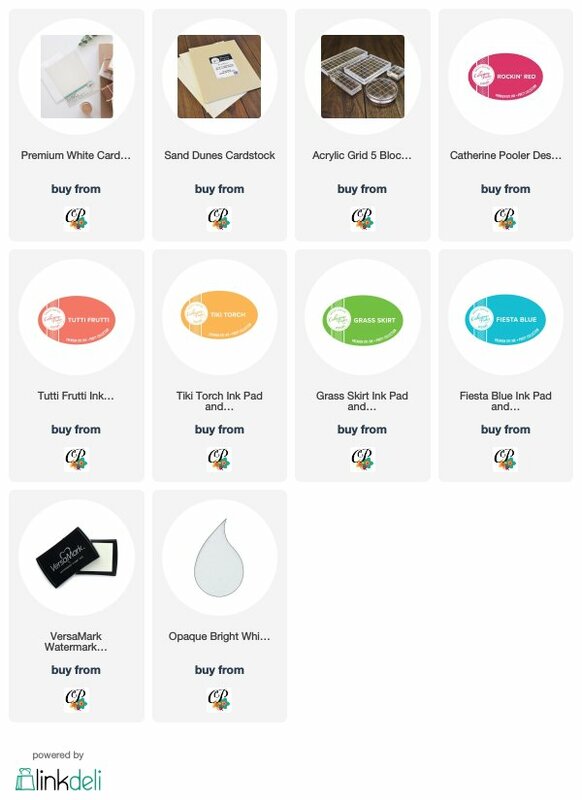 Nicole is giving away a product of your choice from the newest release. Contact me so I can hook you up with your new goodies!! 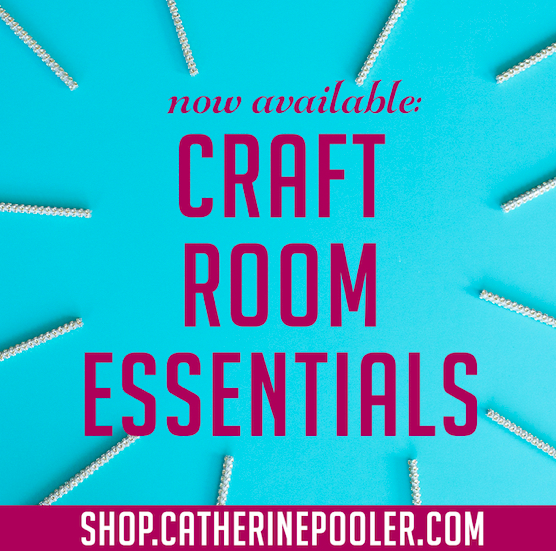 Flash Sale, Giveaway and the Perfect Reason! 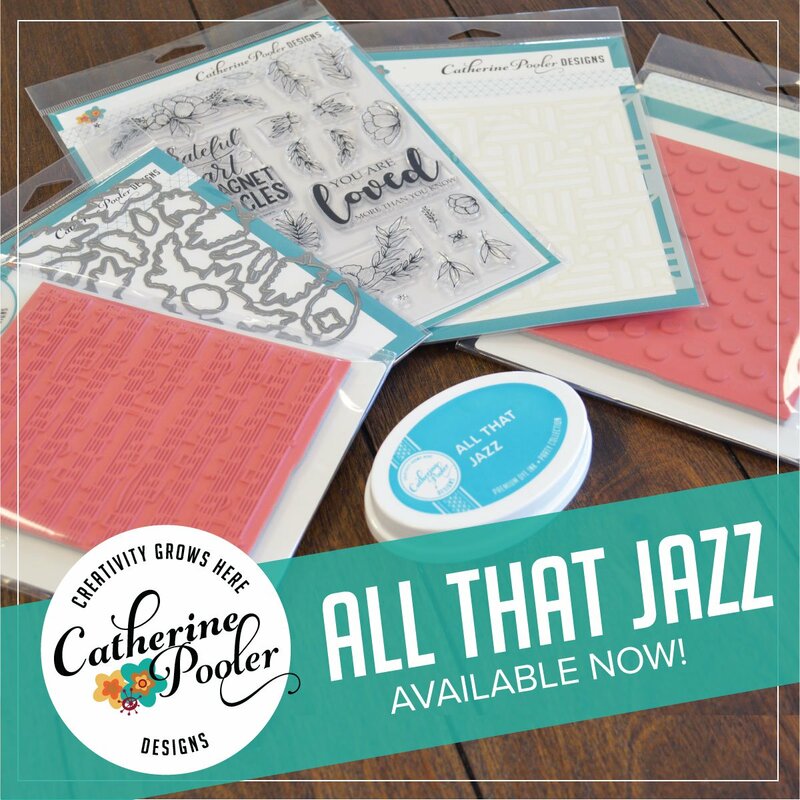 One of my all-time favorite products by Catherine Pooler Designs is the Perfect Reason stamp set and coordinating dies. As you well know, I'm a huge fan of florals and these top the list. 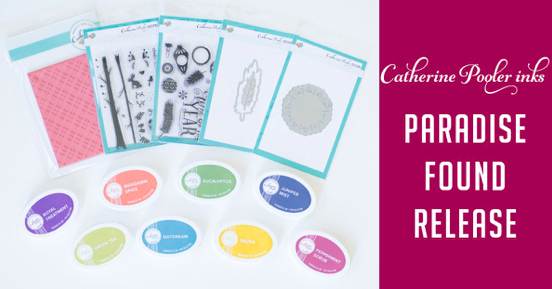 The Perfect Reason stamp set is perfect (haha) for all of the Spring time occasions...Mother's Day, Weddings, even graduations! 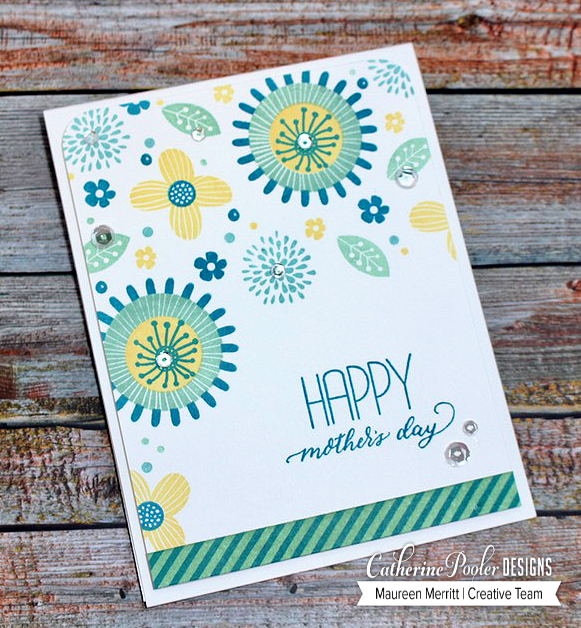 My first card pairs Perfect Reason with YAY Stripes and Simply Stated to make a bright and cheery Mother's Day card. 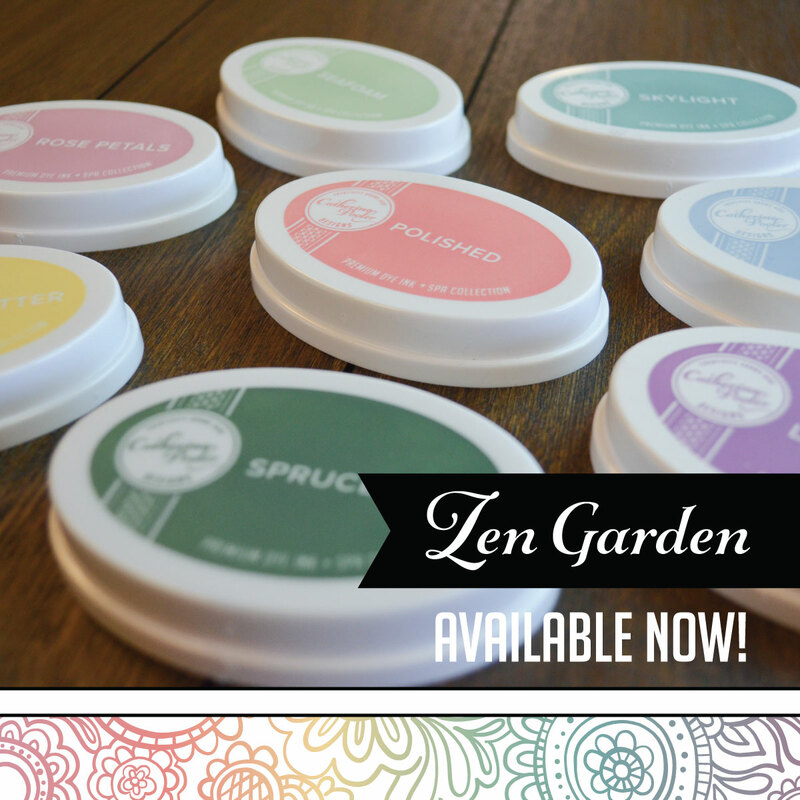 I love the whimsical floral images included in the set. 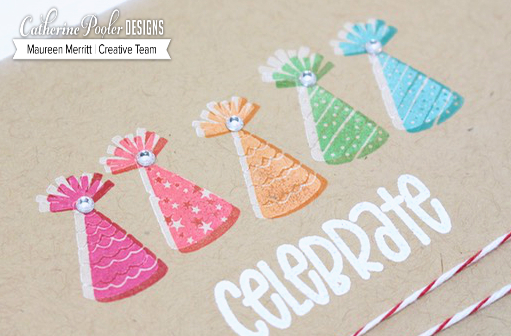 They look great scattered around a card and are perfect for building backgrounds. Using the Perfect Reason stamp set and dies, now paired with Simply the Best and the new Black Tie Gala patterned paper, I've made a wedding card. The flowers placed on a diagonal frame the sentiment perfectly and add flow to the overall design. Can you see why I LOVE the Perfect Reason so much? Are you in love with it too??? I'm giving away one Perfect Reason Bundle! Commenting for the giveaway is now closed. 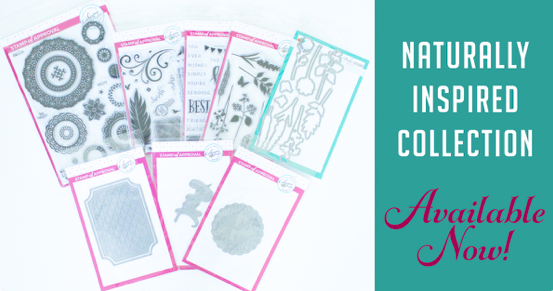 Click here to see the winner of the Perfect Reason stamp set and dies. 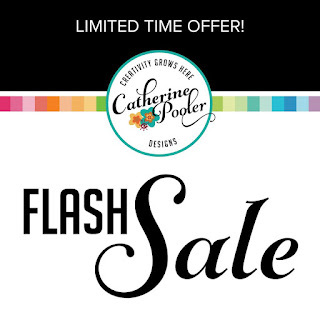 Before you go... there's a Flash Sale going on over at Catherine Pooler Designs. Select products are 20% off until tomorrow April 10th at 9PM. 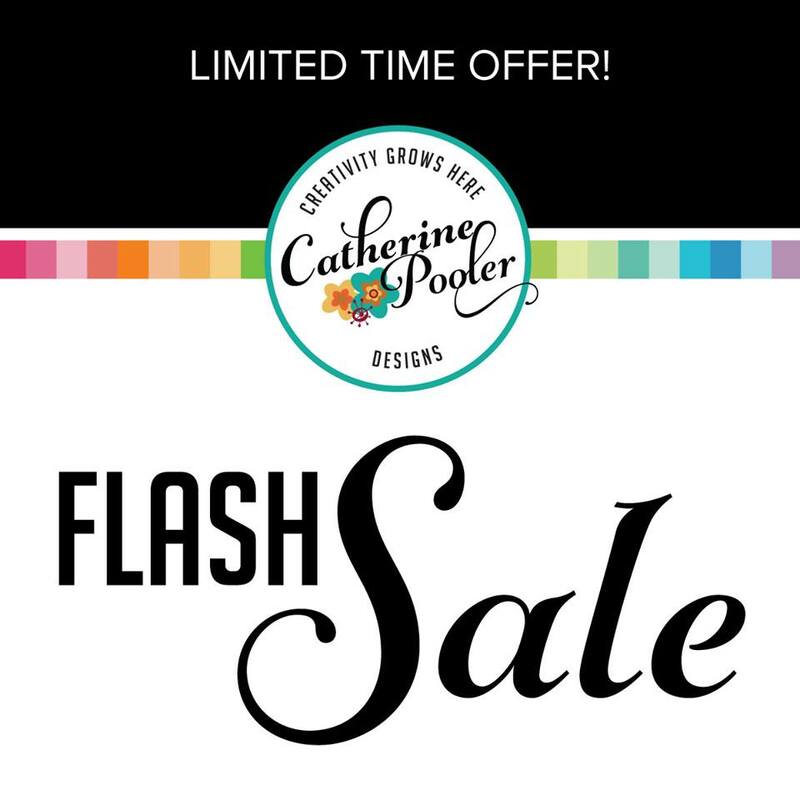 Check out the Flash Sale HERE.